Five years after the rebellion against the rule of Muammar al-Qaddafi, Libya has become the center of a rivalry between the Islamic State and al-Qaeda over the leadership of global jihad, a struggle that should be the focus of intelligence and policy practitioners in this region and beyond. Seen purely in military terms, the strength of Libyan franchises of Islamic State is commonly exaggerated. The group is still a minor player among the constellations of armed groups in this strategic north African country, and can be defeated if the few factions committed to fighting it are supplied with the necessary aid. But as a potential threat for Libya and the wider neighborhood, Islamic State could not have chosen a more central terrain for its strategy of claiming leadership. In jihadi literature, these attacks are part of a strategy of “exhaustion” and “depletion” aimed at confusing, weakening, and deterring enemies. The attacks are also designed to send carefully tailored messages to potential followers, namely al-Qaeda and its sympathizers. In the video showing the beheading of the Egyptian Copts, for instance, Islamic State depicted the act as revenge for the killing of Osama bin Laden. “The sea in which you have hidden Sheikh Osama bin Laden’s body, we swear to God we will mix it with your blood,” the speaker said. The title of the message also echoes a name associated to an al-Qaeda-linked faction, “Those Who Sign with Blood”, which operated in West Africa. The aforementioned attack on the oilfield was carried out by a group previously affiliated with al-Qaeda in the Islamic Maghreb, known as the Tariq bin Ziyad Brigade, said to have retreated to Libya and aligned with Ansar al-Sharia—a Salafist group formed in the wake of the Libyan rebellion in 2011—after the dispersing of militant groups due to the French bombing campaign in Mali. Many other Islamic State members in Libya also have roots in al-Qaeda. Libyan jihadists who had operated within al-Qaeda since the 1990s facilitated the transfer of one of the earliest waves of foreign terrorist fighters to Iraq in 2004. Their links to al-Qaeda—and more importantly to its franchise in Iraq— helped establish their loyalty to the Islamic State today and their ability to appeal to al-Qaeda sympathizers. Such connections also informed the Islamic State’s effort to appeal to the al-Qaeda base through longstanding jihadi figures such as al-Anbari and Bahraini ideologue Turki Binali. Binali was reportedly dispatched to the Libyan city of Sirte in March 2013 and in 2014 to proselytize for the Islamic State and address the issue from the Rabat mosque. He also authored a key booklet about Abu Bakr al-Baghdadi and his claim to the caliphate, Extend the Hands to Pledge Allegiance to al-Baghdadi. There are two main reasons for the Islamic State’s attempts to appeal to this base. It aims to re-assemble the scattered networks of al-Qaeda in Africa, after being dispersed through years of U.S.-led campaign to choke off its finances and logistics. Libya has emerged as a meeting place for many of those jihadists, including a prominent former commander al-Qaeda in the Islamic Maghreb, Mokhtar Belmokhtar, who had later formed his own factions, al-Morabitoon and Signed with Blood. Islamic State’s acceptance of the allegiance of Boko Haram in Nigeria and attempts to attract Taureg in northern Mali and across the Sahel as well as Somalia’s al-Shabab are also part of this wider effort. Depending on how the Islamic State fares in Libya and internationally in the coming months and years, it could prove to be the group that will reorganize the disseminated jihadi cadres in western and northern Africa and the horn of Africa, a possibility that would eclipse the threat of al-Qaeda. It is worth remembering that al-Qaeda’s links or authority over such groups was relatively frail, while Islamic State’s model involves closer leadership and coordination even if local franchises have extensive leeway to run their day-to-day operations. Another reason for its focus on al-Qaeda members and supporters is to attract battle-hardened fighters or ideologues who have the contacts and resilience necessary for the Islamic State to establish its fledgling international terror network. While the Islamic State aims to appeal to as wide a base as possible, it knows that experienced and committed jihadists are key to its project. Along with child soldiers, those demographics are its center of attention everywhere. Jihadists from Africa fighting in Syria and Iraq might also have a future role in this project of expansion. The footprint of Libyan fighters in the battlefield in Iraq and Syria is well felt. Some of the group’s key battles there, such as the suppression of a tribal rebellion in eastern Syria or the seizure of new territory after the fall of Mosul in 2014, were spearheaded by a Libyan faction, al-Battar Brigade, formed in 2012 in Syria mostly by jihadists from Derna, who previously operated within a group with the same name during the Libyan fight against Gaddafi. Some of those fighters later returned from Syria to reinforce the group’s fronts in Libya, operating again under the same banner. Similarly, Tunisian jihadists in Syria and Iraq are some of the most ruthless and committed to Islamic State. Those Tunisians, many of whom trained in and passed through Libya, are a hitherto latent threat to North Africa but one that will undoubtedly be an important chapter in the future battle against jihadists in this region. The Islamic State brand is currently impeded by established allegiance to al-Qaeda. Many of those loyal to al-Qaeda, or to local networks connected to al-Qaeda, are reluctant to recant their allegiance, especially as the Islamic State is still in its early stages. But that may change with time if the Islamic State continues to control territory and prove resilient as a regional force. And Libya is a test to the Islamic State’s nascent project of preeminence, probably more than anywhere else, as it is a test to the world’s effort against it, where lawlessness makes the country a meeting place for long-standing jihadists and for recruitment. 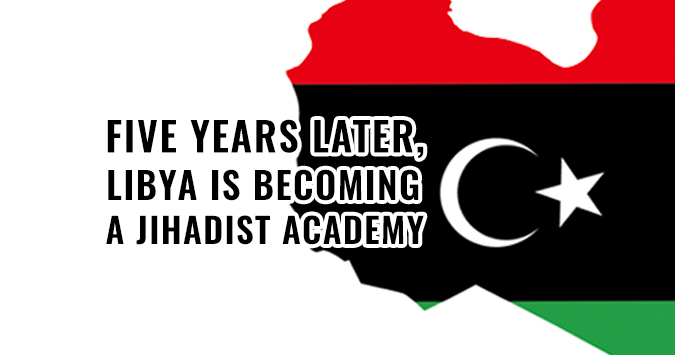 The intensity of debates among jihadists and Islamists and the existence of long-standing extremists are turning the country’s battlefields into an academy producing a new generation of jihadists from across the continent. All of this shows that the Islamic State seeks to be the heir of Osama bin Laden in Africa. It is not true that the organization hopes to use Africa as a fallback base in case it loses in Iraq and Syria, for the simple reason that it is far more resilient and sustainable in Iraq than anywhere else. While Libya might be a haven for jihadists retreating from the rest of Africa, or indeed a stopover for those unable or unwilling to make it to Iraq and Syria, the Islamic State intends to use it as a foothold to expand its reach across the continent while simultaneously expanding from Iraq and Syria. As such, the stakes are high in Libya. World powers that helped liberate Libyans from the reign of terror during Qaddafi understandably find themselves obligated to return to deal with this growing threat. However, the Islamic State presence in Libya must be viewed as a symptom of broader issues that need to be addressed carefully. Viewing the threat solely through a counterterrorism lens will worsen the situation. Even those who fight Islamic State in Libya admit that the group is more organized and has a better strategic foresight than they do, and premature intervention might be exploited by IS to increase division and recruit more people. Political stability remains the main intractable issue in Libya. Disparate factions that toppled the former dictator have so far failed to agree on a unity government and, in the process, division has widened even within those political and religious alliances, despite occasional appearance of progress. After one year of U.N.-sponsored negotiations and under international pressure, representatives of the two governments—a self-declared one in Tripoli, formed after dismantling the parliament, and an internationally-recognized one in Tobruk formed by the General National Conference—agreed in December to set up a nine-member presidential council to oversee the formation of a unity government to supersede the two. A proposal for a cabinet consisting of 32 members was struck down by the Tobruk government, which asked for the number of ministers to be reduced to 17. It also rejected the suggested removal of Khalifa Hiftar, a former general who commands the anti-Islamist Operation Dignity that began in May 2014, under the umbrella of the Libyan National Army. On Sunday, an amended 17-member cabinet was proposed, pending approval or rejection by the involved parties. Hiftar’s role is widely regarded as a cause of rift not only between the two political orbits but within the factions in Tobruk and the military officers supposedly under his command. Professionals and volunteers working within his fold proved committed to the fight against the Islamic State despite poor supplies, but his opponents blame him for the growing strength of the terrorists in Benghazi and Sirte in late 2014. Meanwhile, Islamic State is slowly gaining new territory and its opponents are fracturing or losing morale. Even if the proposed government is approved, the prospect of ending factionalism in the foreseeable future is low. Amid these intractable feuds, Western officials have recently floated the idea of a new foreign intervention to deal with the growing presence of IS, even though its growth is a symptom of the political stagnation perpetuated by regional powers and international dereliction. International fixation with the Islamic State is reflected in the fact that much of the news about Libya in recent months centered around it, and also in the wide suspicion among Libyans that the rush to form a government is designed to ask for an official approval to start a new air campaign, which reportedly included threats of sanctions against political spoilers. The fight against IS must be led by Libyans, and the formation of a national unity government is an opportunity to help them do so. Such support should come in two stages. Even if a full-fledged campaign against the Islamic State is delayed, a new government should be given time to operate and endure before full force is diverted to combating the group. At this stage, support for nationalist forces currently combating the Islamic State should begin immediately as fighters are losing morale amid political bickering. There is, admittedly, a real risk that arbitrary support will strengthen militias, undermine any formed government, and deepen the crisis. A balance should be struck between empowering militias or individuals and waiting until a sufficient measure of national unity is achieved. There are enough forces willing to fight the Islamic State as part of a national army; the key issue has been politicking among the military leadership and interference from abroad. To that end, support for anti-IS forces should increase as those groups meet political milestones. Reliance on local forces to confront the Islamic State on the ground with the calculated support of outside powers has proven effective in Iraq and Syria. Channeling support through state institutions should be the long-term focus, and should begin to take place when a new government is formed, but it is unrealistic and counterproductive under the current circumstances. Similarly, an international rush to strike against the Islamic State without a strategy to enable Libyans to fight the group only repeats failed patterns over the past decade in Iraq and half a decade in Syria. One of the existing problems is that military support is often closely tied to loyalty to individuals, primarily Hiftar, which has led to defection and rupture within the forces fighting the Islamic State and its affiliates. This can be resolved systematically with the formation of a new government. This way, combating Islamic State becomes a tool and a unifying objective to put Libya back together, rather than using the formation of government as a tool to fight the Islamic State. The latter is a disastrous strategy that will fail and ensure that Libya remains a festering wound at the crossroads between Europe and Africa.